Madrid is the capital city of Spain and the largest municipality in both the Community of Madrid and the Kingdom of Spain. The city has a population of almost 3.2 million with a metropolitan area population of approximately 6.5 million. It is the third-largest city in the European Union, after London and Berlin, and its metropolitan area is the third-largest in the European Union after those of London and Paris. The municipality itself covers an area of 604.3 km2. Certain smaller shops have shorter opening times and open from Monday to Saturday, from 10h00 to 14h00 and from 17h00-20h30, closing for lunch. Although most shops in the city center open all day from 10h00 to 21h00 or 22h00. Shopping centres and department stores generally open every day from 10h00 – 22h00. Madrid has some of the best shopping in Spain, with some fantastic local brands as well as international designers. – The area around Gran Vía is one of the liveliest areas of the city center and is great for shopping, dining, or bar crawling. – In Serrano, which is one of the trendiest and expensive neighborhoods of Madrid, travellers will find luxurious shops located in what were once small palaces. – Fuencarral is one of the streets bordering the quirky Malasaña neighbourhood. Taxi fares connecting airport-city center have a fixed price of 30 Eur. Barajas Airport is served by very reliable and moderately priced public transportation. 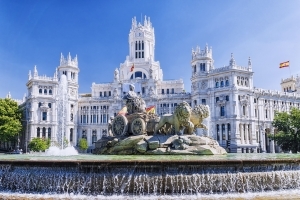 Madrid has a Mediterranean climate which transitions to a cold semi-arid climate, with warm summers and relatively cold winters with frequent frosts and occasional snowfalls. The local currency is EUR.